Native American and Maya legends tell of thirteen life-size crystal skulls containing information crucial to humankind's true purpose and destiny. Crystal skulls are featured in the action movie Indiana Jones and the Kingdom of the Crystal Skull. The action movie Indiana Jones and the Kingdom of the Crystal Skull has based its plot on the real crystal skulls, the story of which is documented in this book- Investigates the Maya and Native American legends that tell of thirteen crystal skulls said to hold vital information about coming Earth changes- By independent filmmakers Chris Morton and Ceri Louise Thomas, whose A&E documentary on the crystal skulls won high acclaim in the United States and abroad- Over 100,000 copies sold worldwideNative American legend tells of thirteen life-size crystal skulls said to contain crucial information about humankind's true purpose and destiny. The legend prophesied that one day, at a time of great crisis for humanity, all thirteen crystal skulls would be rediscovered and brought together to reveal information vital to the very survival of the human race. To date several skulls have been discovered. This book is the definitive guide to the facts and legends that inspired the May 2008 movie Indiana Jones and the Kingdom of the Crystal Skull. It explores what these mysterious crystal skulls are, where they came from, and what they may have to offer. The book follows Chris Morton and Ceri Louise Thomas on their journey of discovery from the ancient temples of the Maya to the British Museum, the Smithsonian, and to the crystal laboratories of Hewlett-Packard, where scientific tests on one of the skulls--made from the same quartz crystal used in today's computers--lead to the conclusion, This skull shouldn't even exist. Their journey also leads to Native shamans and elders who reveal the sacred knowledge and vital information that these skulls hold about coming Earth changes and humanity'simminent destiny. The researcher soon discovers that it is clear some of the skulls are modern frauds, but it is equally clear that some are not. . . . With so much speculation, myth, legend, and controversy, the serious student of the occult will appreciate this well researched and fact-filled book. 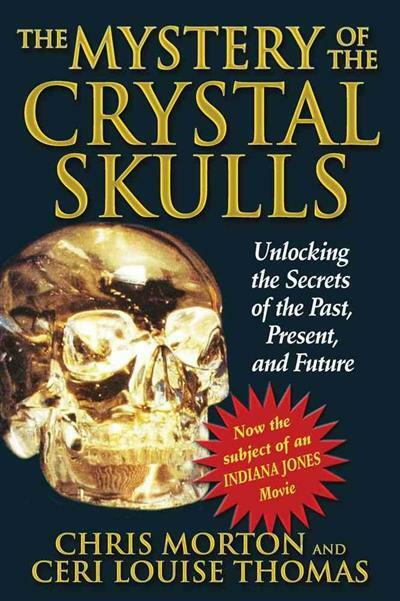 Chris Morton and Ceri Louise Thomas will be sharing their expertise in a 2-hour documentary on the crystal skulls, to be aired mid-May 2008 on the SCI FI Channel on NBC/Universal. Morton and Thomas s A&E documentary on the crystal skulls received high acclaim in the United States and abroad. Independent filmmakers, they now live in Britain, having spent several years in Mexico.